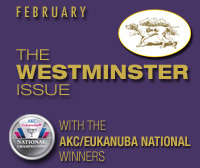 Spanish Water Dogs were granted full recognition by the AKC as of January 1st, 2015. To say that we hit the ring running is somewhat of an understatement. Within 21 days we had our first Champion made up with several more dogs well on the way. With ten months completed we have held our first national specialty, made up several Champions and attained a definite presence in the Herding Group competition. All of this could not have been accomplished without the cooperation of the judges and their interest in these newcomers. While SWDs were in the Miscellaneous Group, the parent club, the Spanish Water Dog Club of America, used Open Shows, judges’ seminars, breed jamborees (unofficial specialties) and numerous illustrated articles to introduce these dogs to the American judging community. Like other “new” breeds, those judges with previous approval for the entire herding group completed the open book test on the standard. In nearly every instance this, combined with their years of expertise, has served the breed very well. Now, nearing the end of our first year of recognition, we are appreciative of the feedback and comments we have been receiving from the judging community. 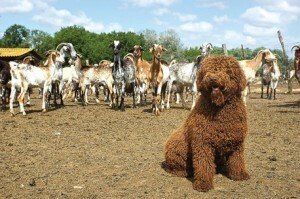 By far the largest number of questions and comments surround the (almost) unique iconic coat of the Spanish Water Dog. The breed standard mentions coat lengths between one and five inches and indicates that the breed is shown either in natural curls or rustic cords with tapered tips. Sounds easy enough, doesn’t it? But the coat is a significant element of breed type and “getting it right” is all important. When a SWD is sheared down (I’m avoiding the use of the word “shaved”) the coat is cut to a uniform length all over the body, head, loin, back, legs, tail and everywhere else in between. It is not sculpted nor is there any significant variation in length, texture or curl. The judge must have enough length of coat present to be able to confirm the coat is curly and of a wooly texture. As in a double coated terrier that has been stripped, you cannot judge what you cannot see. Any attempt to brush, comb or blow dry a coat may leave the hair wavy or straight which requires disqualification. As the coat matures and grows out from the one inch minimum, the curl generally becomes more pronounced and forms itself into cords. Because this is a single coat, without a wooly, fine, undercoat the cords are more round than flat, have a small wispy curl at the end and do not resemble the cords of a Komondor or Puli, nor the flocks of a Bergamasco. The ends are never flat, rounded or vee-shaped. Again as with most corded breeds, there is generally about ½ inch of uncorded hair next to the skin. Despite the fact that this is a single coat, the cords themselves do require some attention to stay healthy. For the most part this consists of manually separating the cords to avoid the appearance of mats. Often this is combined with the cleaning process. The only tools required are one’s fingers, a lap and perhaps a fireside. In our limited experience though, eventually the cords lose their luster and healthy glow and need to be sheared in order to start the process over. As breeders and exhibitors we are proud of our dogs and their newfound status as a part of the Herding Group. That pride becomes evident in our tendency to over groom the dogs and inadvertently depart from, rather than adhere to, the standard. We want to present our dogs to the best advantage, but much too frequently we need a reminder from our judges that less can be more. We earnestly request that you deal with trimming, sculpting, excessive brushing, combing, blow-drying or shaping of the cords by penalizing the dog accordingly. When the dog is shaved (I prefer the word sheared), it is, by definition, cut to the same length over every part of the body. Although some SWDs lack a profuse growth of hair around the eyes and muzzle (a genetic fault), and although the texture is not uniform throughout the dog, the hair tends to grow at a uniform rate. Any obvious difference in length of the hair on different parts of the body may well indicate prohibited grooming. None of this, however, means that judges are expected to examine a dirty, unkempt exhibit. Baths are not a disqualification under the standard nor are other methods of preparing the dog for the ring that make it look, feel and smell like a worthy show dog. The mere use of a dryer will not ruin a cord, but it can and will remove the required curl from a shorter coat. We are fortunate to have within the ranks of AKC, judges who have experience with the breed in other countries. Many of those judges have been kind enough to share with us their experiences abroad and their impressions of our own initial efforts here in the US. The AKC standard is not a complete copy of the FCI standard and color is described in only two sentences. Some very nice dogs that have been shown in the US are of a roan color that is a disqualification under the FCI standard, but is not discussed (and therefore allowed) under both the AKC and TKC standards. Roan (or “roaning”) is defined as an even mixture of white and colored hairs over all or part of the body. In SWDs the colored hairs, thus far, have been of the approved colors of black, brown or beige. The roaning may appear as smaller spots or in larger patches over all or part of the body. At present there is no credible evidence to suggest that the presence of roan coloration is in any way a genetic compromise and is therefore fully permissible under the AKC standard (provided of course that it is limited to the allowed colors). As of this writing we have our first roan Champion made up and on his way to bigger and better things. The next most frequent area of comment or question involves the length of exhibits (measured from point of shoulder to buttocks). The standard says 9:8 as the ratio for length to height, but that is a pretty close tolerance for anyone to judge with a tape measure, much less in a corded dog from 20 feet away within 2 minutes or so. It is pretty safe to interpret that 9:8 as “Slightly (very slightly mind you) longer than tall.” The SWD is not a square breed, nor is it really as rectangular in outline as some others. Being either too long or too short is clearly a fault and should be penalized in considering one’s placements. Another area that has inspired some comment and question is movement in general. Reach and drive, visible in the side gait, certainly merit your evaluation and more often than not will indicate that the front assembly has all its parts where they belong. But side gait is only part of the equation. Our standard indicates that as speed (at the trot) increases, the feet converge toward the centerline of gravity. The SWD should not single track. With the presence of ample coat, this can sometimes be a fine distinction to make. Thankfully, most of our judges are thoroughly experienced at finding and rewarding correct movement. But if there is any doubt, no one will mind if you move the dog again perhaps at a slower speed or on a loose lead. 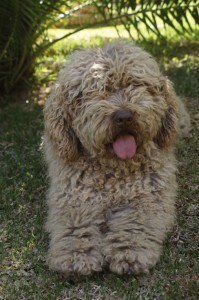 Breeders, exhibitors and handlers and most of all the judging community have done very well by the Spanish Water Dog. We haven’t seen the reserved temperament that sometimes appeared in the foundation stock. This is due in no small measure to an intensive effort at early (and continuing) socialization in all types of situations. There are no known prevalent health problems within the breed although our club’s Health and Wellness Committee continues to monitor overall breed health. Bites are pretty good across the board and you probably don’t need to count teeth. We still don’t have a lot of information on tails. Many SWDs are born with bob-tails (or no tails) while others are docked. We think the future holds a lot more exhibits with natural undocked tails and the elements of tail shape and carriage await your comment and feedback. Early on, by a vote of the membership, the club elected not to make mandatory the use of a ramp for judging. The feeling was (and is) that this is a working breed that belongs with its four feet on the ground. What do you think? Many judges have been kind enough to communicate with us directly regarding their comments on the breed, and its presentation in the show ring. The SWDCA welcomes and appreciates all of these communications, both pro and con, and fully addresses and answers each contact. 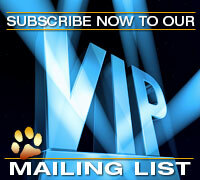 We encourage each of you to let us know what you think. Most of all, to each of you, thank you for your acceptance and support of Spanish Water Dogs. Posted by ralbee on Nov 12 2015. Filed under Current Articles, Editorial, Featured. You can follow any responses to this entry through the RSS 2.0. Both comments and pings are currently closed.